I grew up in Florida where a cool, refreshing glass of sweet tea could be found almost anywhere. Every restaurant offers diners a choice between sweet or unsweet, Publix (the grocery store of choice) makes a great house brew and everyone has a homemade recipe that they swear by. Unfortunately, things changed the moment I moved to New York. It’s hard to find a classic glass of sweet tea around here and when you do, they’ve usually tried to do something fancy to it like add a bunch of unnecessary mint or another flavor that takes away from this simple treat. 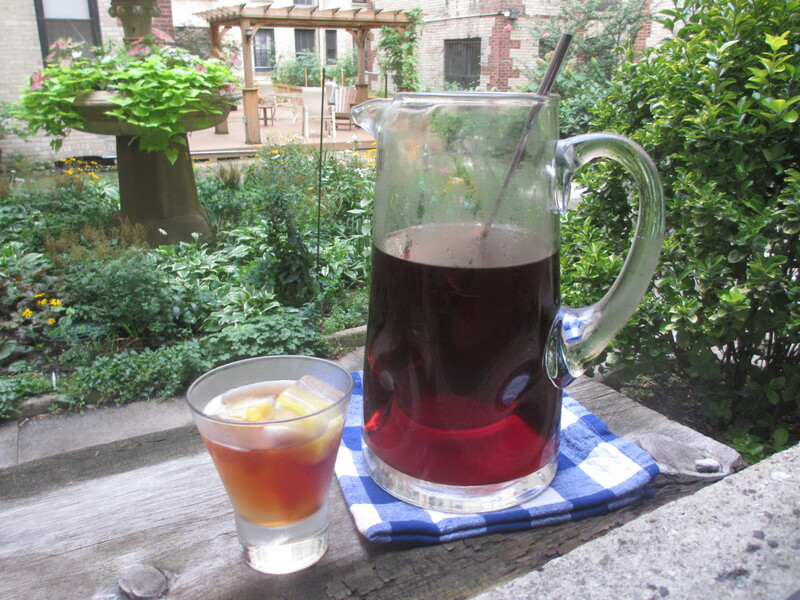 This weekend I whipped up my own pitcher of sweet tea and it couldn’t have been more delicious! I don’t make the tea very often (it is LOADED with sugar!) so I did a few things to make it extra special. First, I added a pinch of baking soda to cut the bitterness you can sometimes taste with iced tea. Second, I used Red Rose tea bags—the only kind my Grandma would approve of. And, finally, I did a little something special to the ice cubes. I guess some of that NYC fanciness rubbed off on me after all! 1. Slice the lemon into thick rounds then cut each one into quarters. Add about two pieces to each well of an ice cube tray, fill with water and freeze. 2. Meanwhile, add the baking soda to a large pitcher. Set aside. 3. Bring 5 cups of water to a boil. Then, add the tea bags and let steep for 10 minutes. Remove the tea bags, and stir in the sugar until dissolved. Set aside to cool for 5 to 10 minutes. 4. Add cooled tea to pitcher and top with about 4 cups cold water (use more or less depending on the size of your pitcher and how strong you would like your brew). Chill in the fridge until ready to serve over the lemon ice cubes. SWWU Tip 1: Craving a more sophisticated flavor? Use vanilla-flavored sugar instead. Check out our easy recipe. SWWU Tip 2: Tie all of your tea bags together (as shown in the photo above) so you can retrieve them easily once the brewing is complete.